President Barack Obama nominates Samantha Power as the new US ambassador to the United Nations in the Rose Garden of the White House in Washington, DC, on Wednesday. A self-described "genocide chick" could be this nation's next U.N. ambassador. 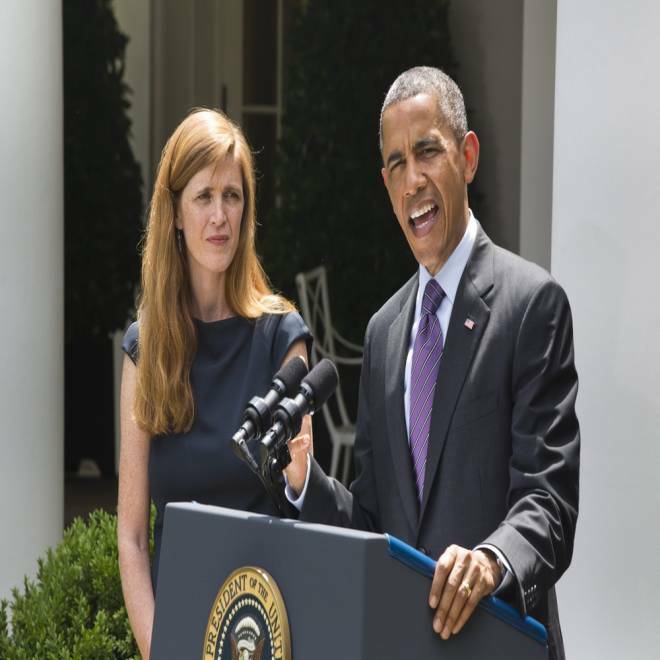 Samantha Power — an unrelenting human rights advocate who isn't afraid to speak her mind, sometimes to a fault —was nominated for the position Wednesday afternoon by President Obama. If approved by the Senate, Power would replace Susan Rice, who after a controversial tenure at the U.N., has been chosen to replace Tom Donilon as national security adviser. As an intrepid young journalist, Power witnessed horrors in Bosnia and the former Yugoslavia, winning a Pulitzer Prize for a book on genocide. Later, she worked on Obama's presidential campaign, but abruptly resigned after calling Hillary Clinton a "monster." She bounced back to run the White House's human rights office. One thing Power has not done is hold a diplomatic post — and now, the woman who has "seen evil at its worst" has her first shot at one. Samantha Power is seen at a FORTUNE Most Powerful Women Dinner at the U.S Department Of State's Benjamin Franklin Diplomatic Room on April 30, 2012 in Washington, DC. Obama’s pick was lauded by human rights activists. "She's an excellent choice," said Kenneth Roth, executive director of Human Rights Watch. "She's seen evil at its worst in the time she was in Bosnia. She's very aware of the violent threats to humanity that are posed by certain nefarious forces around the world. These are precisely the kind of threats that she will need to address and encourage the Security Council to address as U.S. ambassador." Power, 42, was born in Dublin, Ireland, but raised in the United States. After graduating from Yale and Harvard Law School, she spent her early career as a correspondent for Time Magazine and later The New Yorker, reporting from anywhere crises were happening: Kosovo, Rwanda, Sudan. Laura Pitter has known Power since 1992 and was a journalist with her in Bosnia during the Balkan war. "She is brilliant," Pitter, who is now a lawyer and counterterrorism adviser for Human Rights Watch, said. "I can't think of a better candidate for the position she's been nominated for." That opinion isn't shared by writers at conservative web magazine American Thinker, who have been writing harsh critiques of Power since 2008, arguing that Power is a "notorious critic of Israel." "She's problematic. She's made some some very questionable statements regarding Israel," said Ed Lasky, co-founder of American Thinker. "She seems to have a strong allegiance towards United Nations and international bodies, and those have not been organizations that have been favorable towards America or toward Israel." Power's time as a Balkan war correspondent prompted her to later write a book on genocide. In 2002’s "A Problem from Hell: America and the Age of Genocide," Power explored why U.S. policies have repeatedly failed to stop genocide from re-occurring abroad over the last century. The book won Power a Pulitzer Prize the following year, and catapulted her name into political stardom. "Her greatest claim to fame, which I think she even says, is she's a 'genocide chick.' God help us, but that's Samantha," said Graham Allison, a professor at Harvard's Kennedy School of Government who has known Power for over a decade and co-authored a book with her. “A Problem from Hell” argues that in many countries, specifically Bosnia and Rwanda, the U.S. could have prevented the murder of at least tens of thousands of people, but politicians' judgment got clouded by geopolitical considerations and worries over domestic support that stopped them from acting. Former U.N. Ambassador Richard Holbrooke once said of the book, "It's very painful reading, but it has to be read." Power's knowledge of genocide will be applicable to any humanitarian crisis, whether it is officially classified as genocide or not, Allison said. She proved this in 2011 with the crisis in Libya, he said, and he believes she'll be an asset for the ongoing Syrian crisis. "In many instances, we can do something that actually has a huge effect. It's not like we're spending too much blood or treasure," he said. Power has known Obama since he was a senator; she joined his office in 2005 as a foreign policy fellow, taking a year off from teaching at Harvard to work for him. He had sought her out after reading her book. Six years later, in March of 2011, as the Libyan human rights disaster was escalating, Power was serving on the Obama's National Security Council as special assistant to the president and senior director running the office of multilateral affairs and human rights. She encouraged Obama to use military force in Libya, and a no-fly zone was established. Failure to set up a no-fly zone would have been “extremely chilling, deadly and indeed a stain on our collective conscience,” Power told a crowd at Columbia University in New York in March 2011, reported The New York Times. "Libya's a great case, where we wouldn't intervene on the ground and bleed and kill people," Allison said. "Samantha's job at the NSC was to try to get those dimensions integrated at the high table when people were trying to figure out what to do." Power, who generally keeps a low profile — neither she nor her husband, legal scholar Cass Sunstein, returned request for comment for this story — had a moment of infamy on Obama's 2008 campaign trail. Serving as a foreign policy aide to Obama's campaign at the time, Power called Hillary Clinton a "monster" while under the impression that she was speaking off the record to a Scottish newspaper. "We f***ed up in Ohio," she told The Scotsman newspaper. "In Ohio, they are obsessed and Hillary is going to town on it, because she knows Ohio's the only place they can win. "She is a monster, too – that is off the record – she is stooping to anything," she said. She resigned from the Obama campaign shortly after the remarks were printed. I extend my deepest apologies to Senator Clinton, Senator Obama, and the remarkable team I have worked with over these long 14 months," Power said in a statement. Power lives with her husband, legal scholar Cass Sunstein, and their son Declan in Washington, D.C. Neither Power nor Sunstein returned request for comment for this story. "She's never held a diplomatic post, so this is a big step up for her. But she has the personal skills. That's a real contribution that she'll make. She will put the time and effort in to maintain the friendly relations with the other ambassadors, which in a moment of crisis will make a difference and can be very important for getting things done," Roth, the Human Rights Watch executive director, said. “Even if she doesn't have the formal background, she has the important skills that will let her succeed." Following her nomination on Wednesday, Power got a nod of support from Sen. John McCain, R-Ariz.
"I believe she is well-qualified for this important position and hope the Senate will move forward on her nomination as soon as possible," he said in a statement. Roth said he's not worried about slips-of-the-tongue like the "monster" comment after four years in the White House, which have made Power a seasoned professional. In her role as U.N. ambassador, Rice generated controversy days after an attack at the U.S. Consulate in Benghazi, Libya, on Sept. 11, 2012, killed four Americans. Appearing on NBC's "Meet The Press," she said the attack had begun as a spontaneous protest against an anti-Islam film, rather than a terrorist attack.